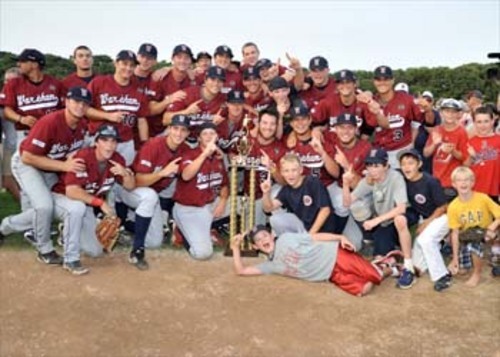 SOUTH YARMOUTH -- West champion Wareham wears the Cape League crown today after one of the most dramatic comebacks in the history of the league's championship finals. 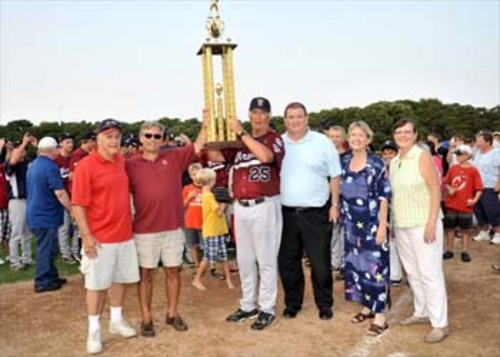 Trailing 5-2 and three outs away from defeat, the Gatemen spoiled the beautiful late summer evening for the host Red Sox and their legion of fans at Red Wilson Field Friday, rallying for three runs in the ninth and three more in the 10th for a stunning 8-6 win. But even the Y-D followers, who made up the majority of the 4,250 spectators on hand, had to admit that this was one for the ages in a best-of-three series that went right down to the wire -- plus an inning. 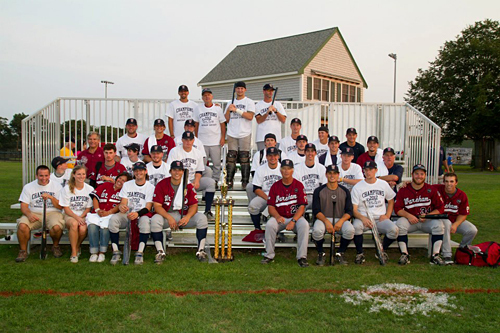 The championship was the first for Wareham since the team won back-to-back titles in 2001 and 2002, and its sixth since 1963. 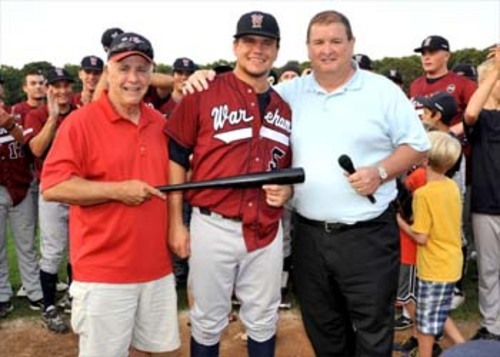 There were a lot of legitimate contenders for series MVP, but in the end Kyle Schwarber (Indiana) took that honor, clocking a solo homer in the ninth to bring Wareham within two runs, then going one better with a two-run blast in the top of the 10th to break the 5-5 tie. But you never would have picked him for any recognition after his first three at-bats: He struck out each time. “We just kept battling,” Schwarber said after accepting his award. “It’s what we’ve done all year. 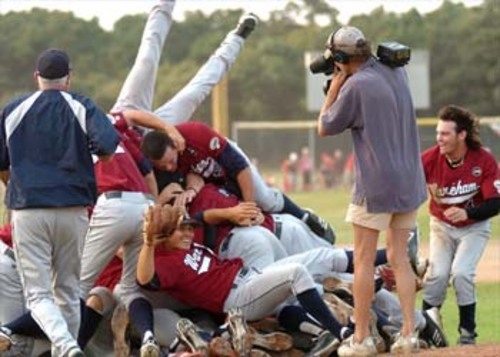 I just can’t believe that we’re the Cape League champions. It’s a great feeling.” This, he said, was his first championship ever. Schwarber’s teammate Mott Hyde (Georgia Tech) deserves a huge share of the glory for the Gatemen, delivering the two-run homer that tied it with one away in the ninth, after a single by Daniel Palka (Georgia Tech). Until those last two frames, Y-D’s Robert Pehl (Washington) was wearing the Superman cape, having launched two-run homers in both the fourth and eighth innings. Bryan Verbitsky (Hofstra) took the loss, allowing the last three runs in 1.1 innings of relief. Wareham closer Colby Suggs (Arkansas Fayetteville) got the win, despite allowing Pehl’s two-run homer in the eighth. Ironically, this started out as a pitchers’ duel. Red Sox starter Alex Gonzalez (Oral Roberts), working on three days’ rest, struck out the side in the first (after allowing a one-out single), then K’d the first two batters in the second. He wound up with 11 strikeouts and just one walk in his six innings, allowing two runs and five hits. Wareham’s Fred Shepard (Amherst College) was also effective, allowing just two hits and two runs, one unearned, in five frames. He had six strikeouts and no walks. But in a summer when home runs have been as prevalent on the Cape as shark sightings, the reachable fences at Wilson Field were no match for the power of these two clubs. In addition to Schwarber, Hyde and Pehl, Tyler Ross (LSU) had a two-run smash in the top of the fifth to tie it at 2-2. In all there were seven home runs, four of them by Wareham. Carlos Asuaje (Nova Southeastern) of the Red Sox had the final one, a solo shot coming with one out in the bottom of the 10th. As for staying with Suggs, even after he allowed Pehl’s two-run homer in the eighth, Ferris said he never hesitated. “I knew we were going to have to put it on his shoulders,” he said. Both teams’ bullpens were running on fumes at this point in the season.